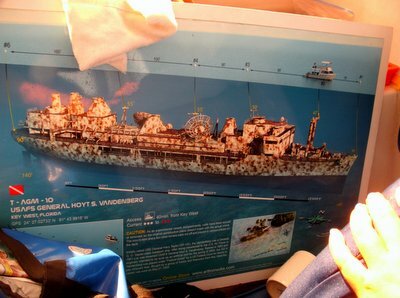 The Gen. Hoyt S. Vandenberg was sunk as an artificial reef on May 27th, 2009 and has since acted as a site for recreational divers and fishermen alike. 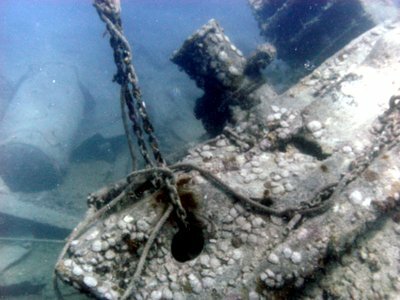 The wreck lies at 140ft just off Key West with its decks sitting at about 100ft, providing nearly 45 vertical feet of habitat in an otherwise sandy bottom, open water area. 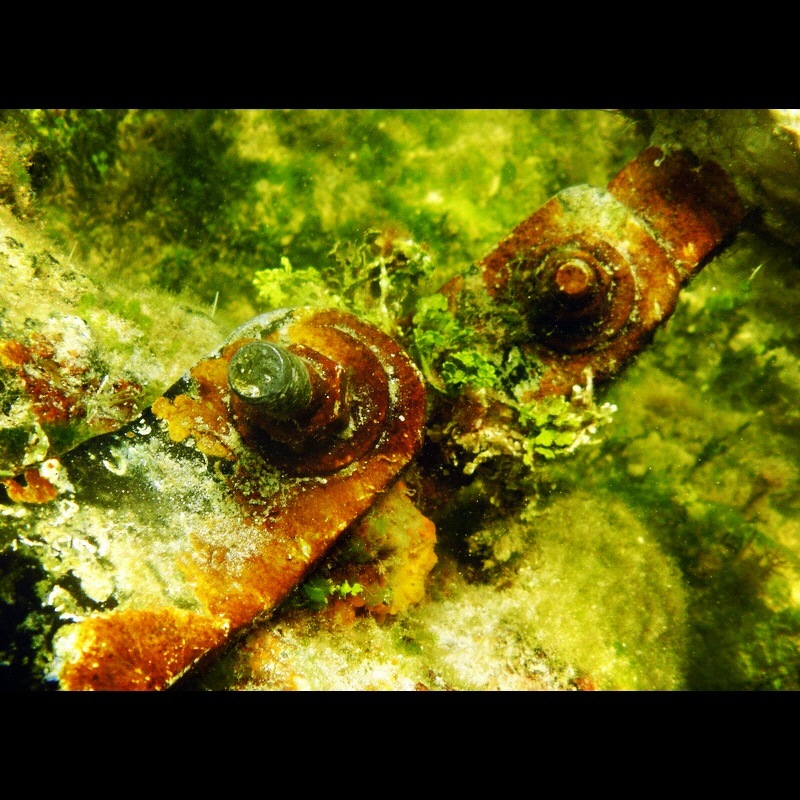 As part of their monitoring programs REEF was contracted under a grant from the state of Florida to observe and monitor the fish assemblages associated with the wreck. The primary goal of REEF’s monitoring efforts are to describe and comparatively quantify fish assemblages found on the Vandenberg as well as neighboring sites (both reef and artificial). 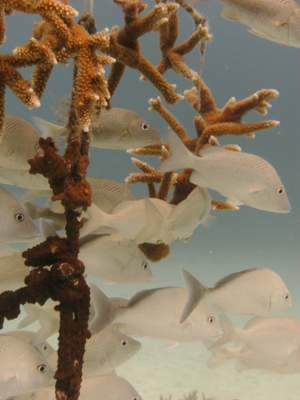 Since their first round of monitoring pre and post sinking of the Vandenberg (2009-2010 Summary Report) REEF has been sending members of the Advanced Assessment Team (AAT) to document changes in both the presence and absence, sighting frequency, and estimate abundance of reef fish over time. The Gen. Hoyt S. Vandenberg prior to sinking. More images before and after click here. Early July I was assigned the task of organizing the next round of AAT monitoring for this survey project. 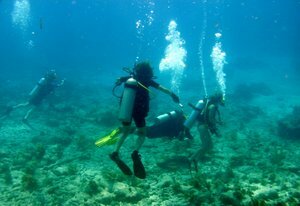 The first thing to do was contact Dive Key West, the dive company that has hosted past REEF monitoring trips, in order to set up a week of diving! On my first attempt I unknowingly had aimed for the trip to coincide with Lobster Mini-season… that wasn’t going to happen! 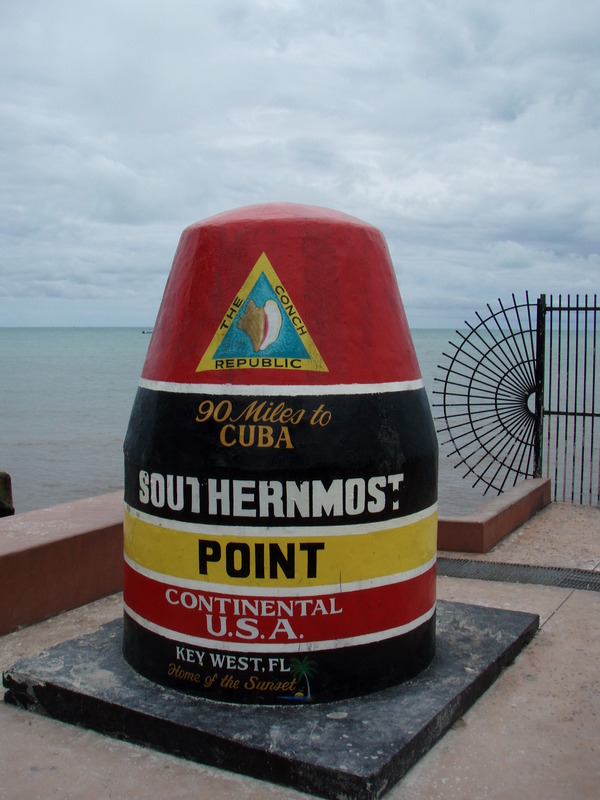 Fortunately the staff at Dive Key West was very helpful and accommodating and eventually we settled on the week of July 30th– August 3rd. 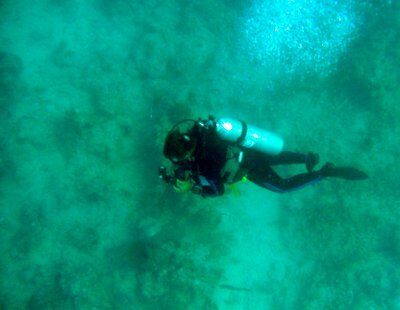 Once the dates and dive sites were set it was relatively smooth sailing from then on. I contacted the group of TWA AAT divers calling for volunteers and got a great response back over the course of a week or two. In the end, we had AAT members traveling from all over the US including South Carolina, N. Florida, Key Largo, and even one ventured all the way from San Francisco! 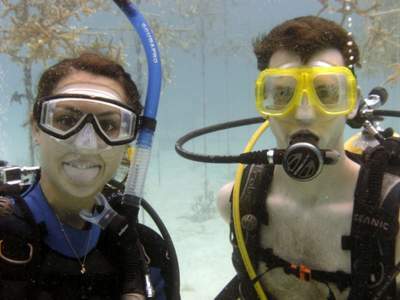 Jana (fellow intern and dive buddy extraordinaire) and I decided rather than driving from Key Largo to Key West every day for three days we decided to camp and make an adventure out of the survey trip. On Monday, the day of the first dive, we wake up circa 5am and hit the road. We arrive in Key West and at the dive shop at about 7:30 and low and behold there was already a small gathering of divers in front of the shop… we knew instantly that these had to be the first of the AAT members to arrive! While we made the rounds with introductions the rest of the AAT members started trickling in. Once we were all assembled we headed into the shop, checked in, loaded gear, then headed off to the marina!! Once we arrived at the Easy Diver we met our captain Steve and first mate Jeremy who were already familiar with REEF, our survey projects, and they were even kind enough to load all our gear! On the first day of diving we headed out to Western Sambos Deep (WSD) and Shallow. West Sambos Deep is a slopping low profile reef starting at about 60+ft in depth. The team and us interns giant stride into the water to kick off the survey trip! 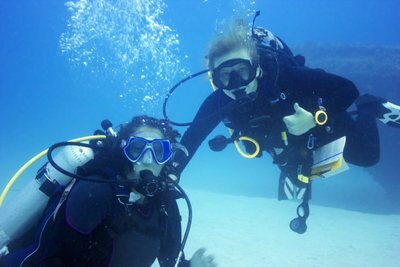 Unfortunately on the first dive (WSD) we did not have the best visibility so Jana and I just hung around the anchor line for fear of being those divers who get lost (not cool when you’re trying to hang with the big kids!). After a brief surface interval with a passing pod of dolphins we traveled to an adjacent site— Western Sambos Shallow aka the Haystacks. As the name implies this was a shallower dive of only about 15-30ft. 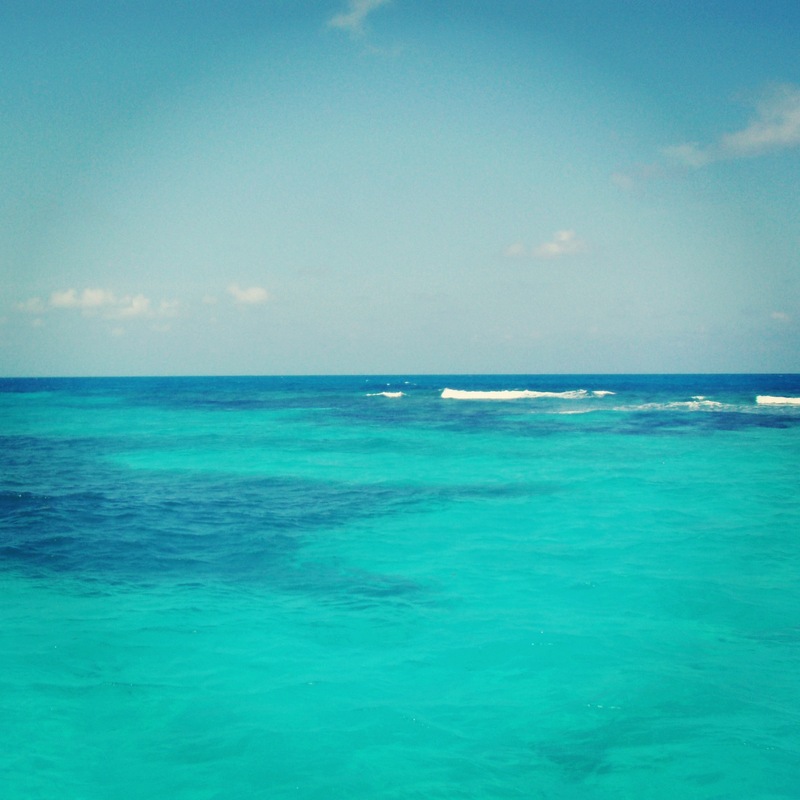 This was quite an amazing dive with large coral formations and plenty of fish! On this one we decided to follow Obi-Wan (the master himself), Lad, around because lets face it, he knows his fish! 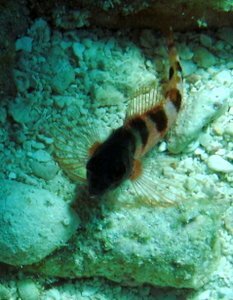 Our plan worked and I think on this dive alone I learned how to spot a handful of new species including the Rough Head and Secretary Blenny and the Red Hind of the Grouper family. All in all not a bad day of diving… and that was only day one! After we wrapped up our dives Jana and I headed to Leo’s Camp Ground to make camp and bunker down for the evening! The following day was an early one again but also the one we were looking forward to the most—The USS Vandenberg (aka the Vandy). Upon entering the water you could feel the ripping current, the kind of current that makes you look like a flag on a flag pole in a hurricane as you hold onto the anchor line! 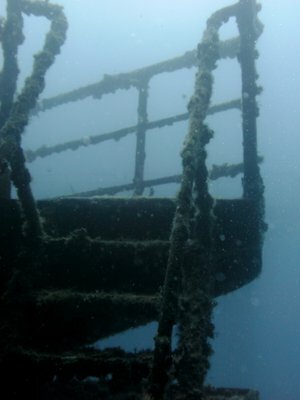 However, the visibility was amazing and we could see the wreck as we descended to its decks sitting around 100ft below the surface. The wreck is huge! Even without a current to swim against I don’t think you could see the whole thing on one tank. But before entering the water I had said that the only thing I really needed to see was the communications satellite and guess which mooring buoy we tied on to… Ball #3, sitting right on top of the satellite. 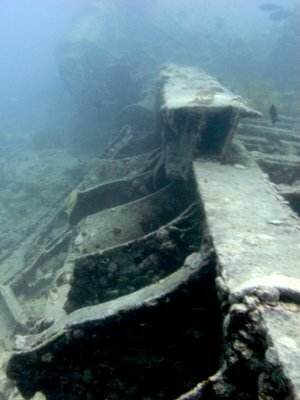 Although we didn’t get to see much of the wreck we were able to make it towards the front to the helm, observation deck, and even spotted some of the images from the “Life Below The Surface” photography show by Andreas Frankes. The second dive of the day was over at Joe’s Tug (a stone’s throw from the Vandy). Joe’s Tug sat at about 40-65ft and was actually a pretty sweet dive. If I sound surprised it is because I figured once you saw the 3rd largest artificial wreck in the world other ships might pale in comparison, but no, that is not the case here. 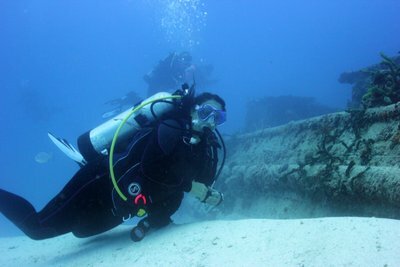 Although a lot smaller and not as intact Joe’s Tug was a pretty sweet dive too! After diving the Vandy and Joe’s Tug Jana and I actually had an afternoon off and what better way to spend that time then lounging around on a beach?! The only reason I bring this up is to tell the following story… At this beach, which was deserted, there was a small area marked off by a blue and white rope to warn people not to enter the marina waters with all the boat traffic. This mini-swim area was the perfect place to pop in for a quick dip to cool off. While standing about waist deep from the corner of my eye I catch a glimpse of a large shadow on the sand by my feet. Now, my mind instantly runs through a million ideas landing of course on the obvious, Shark, before I can even process what I’m seeing. After a beat (and the adrenalin rush subsides), I come to my senses and softly utter to Jana “Manatee”. The manatee was less than a foot away from us and continued to swim up the slope, circle around us, than back out to the marina. Never having seen a manatee in the wild I was shocked… then it came back! And did another circle. It was amazing!! Now back to the diving…On our third day, and final day, we ventured out to Marker 32 Deep and Shallow. Marker 32 Deep, like Western Sambos Deep, is a low profile sloping reef with a starting depth of about 60ft. 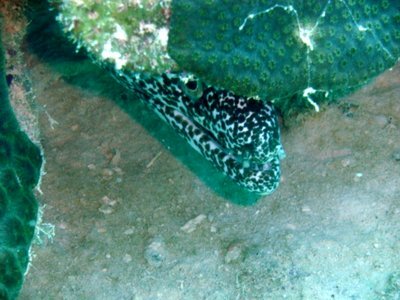 Here we got to see some cool things like a large, rather well camouflaged, Black Grouper and a Butter Hamlet which I love to find! After our 30min survey time we surfaced, spent our surface interval jumping off the observation deck of the Easy Diver, then it was back in the water at our final site of the trip, Marker 32 Shallow (locally known as Topino Buoy). This was a spur and grove reef site with a max depth of barely 25ft. 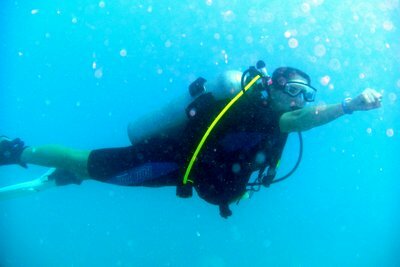 I loved this dive! 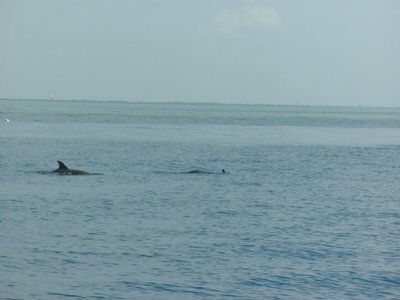 In fact, it may be one of my favorites since I’ve been in the Keys. There was so much diversity in both fish and coral species. Right off the bat I saw something I’ve never seen before which turned out to be a Slender Filefish! The rest of the dive was made that much more amazing by spotting about 5 Red-lipped Blennies, Nurse Sharks, juvenile Blue Tangs and Puddingwife Wrasses. In the end of this dive I had identified 54 species— my greatest count to date! In the end, the trip was an amazing experience, both for the diving and for meeting some of the amazing AAT members. Jana and I left Wednesday evening but the other two interns, Joel and Jessi, joined the crew Thursday morning to complete the survey week. 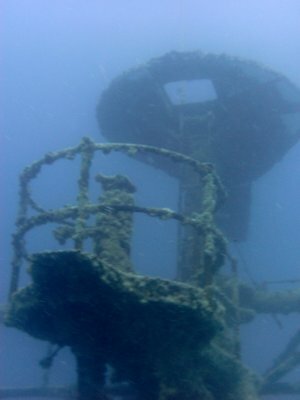 They too and an incredible time diving the Vandy and Joe’s Tug once again and a second site (Eastern Dry Rocks Deep and Shallow) that we never made it too. In addition to having a phenomenal time, the 6 survey dives I completed during this trip put me just at 25 survey mark which meant I was eligible to take the Level 3 exam. I’m happy to report I passed with flying colors and am now one step closer to joining the AAT ranks! So a big THANK YOU goes out to all our AATers who were able to join, REEF for allowing us low on the totem pole interns to join, and the staff of Dive Key West who were a great throughout the whole trip! The AAT Members and Interns (L to R): Mary Jo, Jim, Jessi, Joel, Rob, Katie, Lad, Joe, Laureen, Peter, and Kreg. 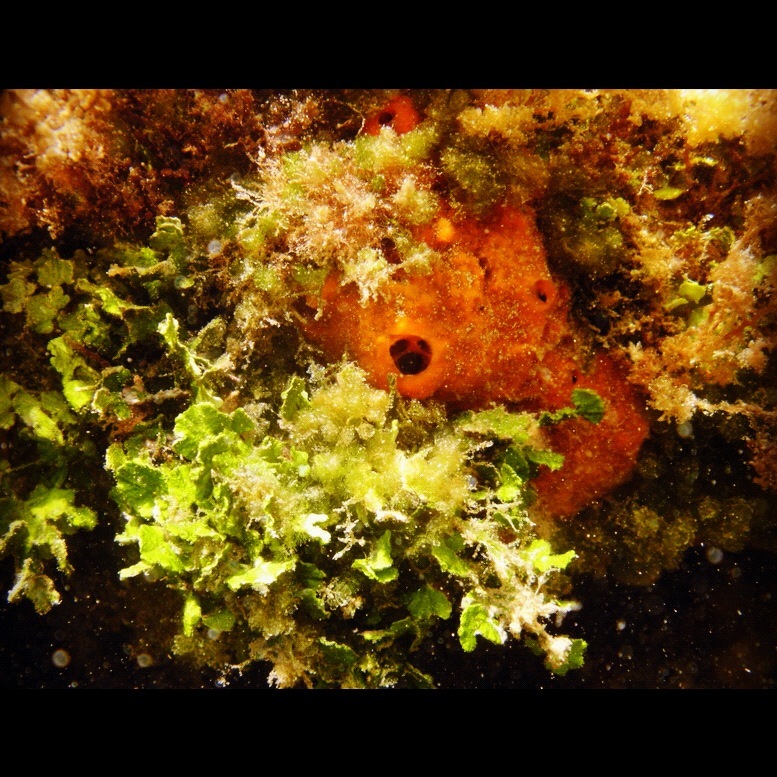 This entry was posted in 2012 REEF Marine Conservation on August 7, 2012 by Martha. 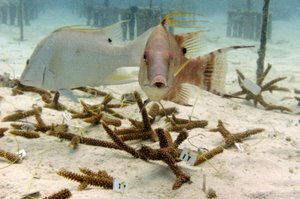 The Great Annual Fish Count- Key Largo Style! In an earlier post (One fish, two fish, what’s that fish?!?) 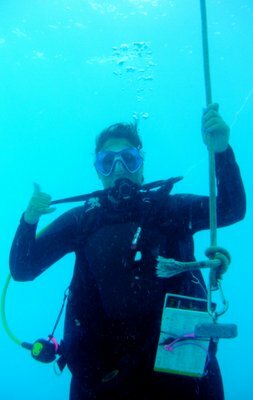 I mentioned REEF’s volunteer fish survey project… I wanted to re-visit this topic in a second post in honour of the completion of the Great Annual Fish Count (GAFC)!!! 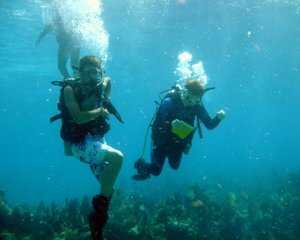 GAFC is a nation-wide month long event where various dive shops and Field Stations host fish ID survey dives and snorkel trips. Although you can do a survey any time of the year July is the month for one large push to get the word out and get a huge amount of surveys done anywhere. 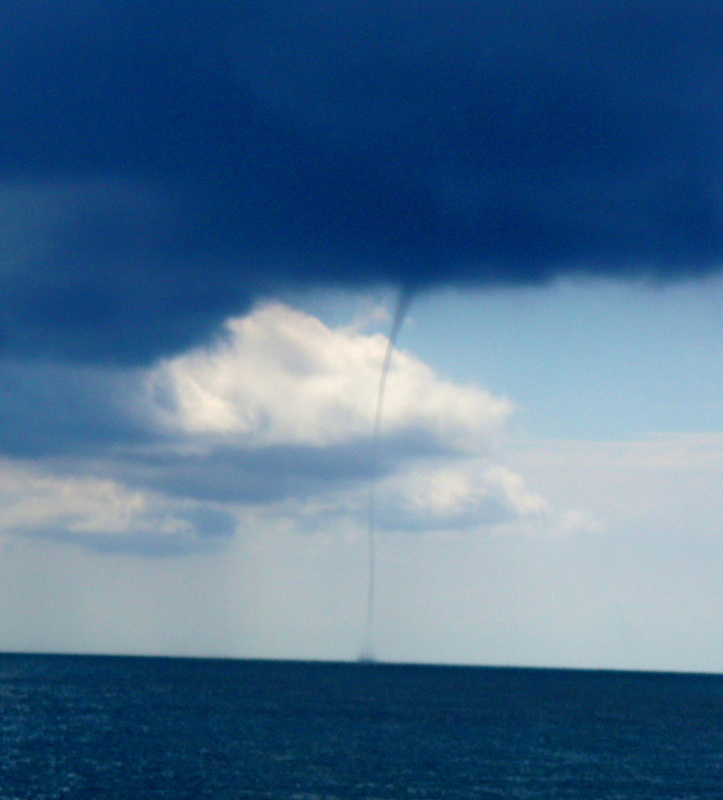 Although there were individual events all over the US, I’ll focus here on those that were in/around Key Largo. Each fish ID and survey event begins with a Tropical Western Atlantic (TWA) presentation where we go over the basics in identification markers, behaviour and in general what to look for while you are in the water. The first event I got to go to was actually up in Miami with The Miami-Dade Reef Guard Association hosted at the Tarpoon Dive Center. 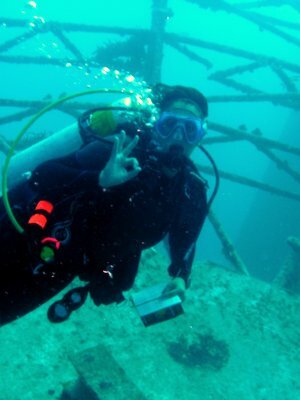 Reef guard has been involved in REEF survey dives for years! Nick, their VP, invited myself and Jessi (another intern) to Miami for a presentation and dive on a site composed of several wrecks and rock piles (Dive tour). I don’t think I expected to meet such a lively group of people who simply loved diving and were just there to have a good time! They were hilarious and a super nice crew to meet and dive with! We arrived at the shop with ample time to set up, ran through the presentation with a very interactive audience (which is always the best), then we get our gear ready for the trip out there. The dive was awesome for a couple of reasons but mainly because it was nice to see a new site with crystal clear water (even at 60+ feet), and I think there was Miracle-Grow in the water because I have never seen Yellowhead Wrasse so big before! Any who, lots of fish which made for an excellent count! Thank you Reef Guard for having us up to Miami! “Our trip was great! We really enjoyed all aspects of it, including the REEF session Monday and the survey dives on Thursday. 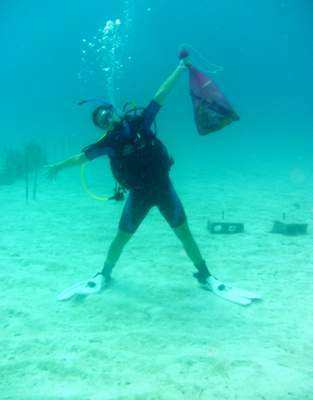 I was really happy to see the youth participating … … every time I saw a youth underwater they had the forms in hand. So, with any luck we’ll see some more surveys coming from these guys! 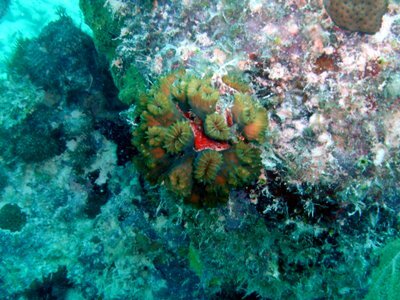 This entry was posted in 2012 REEF Marine Conservation on August 3, 2012 by Martha. One of the many perks to the internship with REEF are the opportunities to volunteer with other non-profit groups in the area. 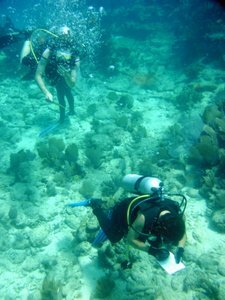 Of the volunteering I’ve done so far one organization stands out as a favorite which is the Coral Restoration Foundation (CRF). I contacted CRF a while ago (even before I was in Key Largo) asking if I could be a volunteer. 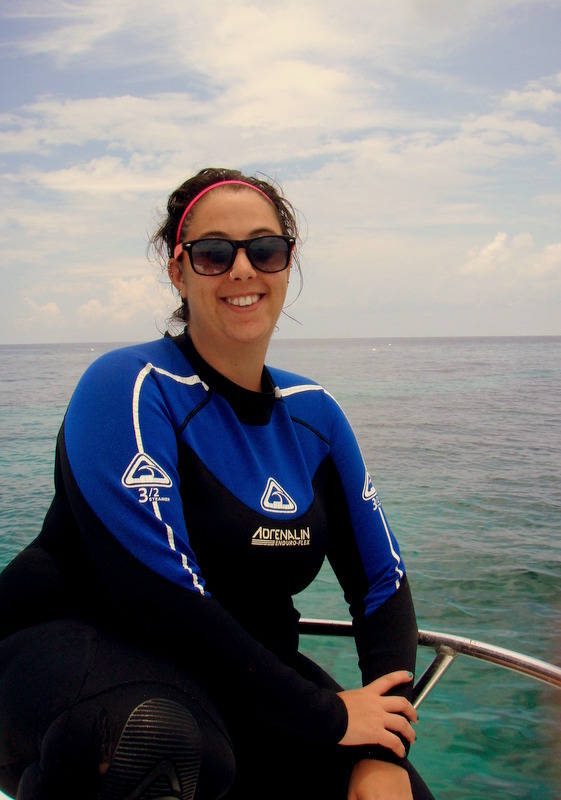 Turns out their Science and Education Director is none other than former REEF intern and OWUSS scholar recipient, Stephanie Roach! Not having done anything like this before, on my first day out with CRF I had no idea what to expect. Jana and I met up with the CRF crew behind a warehouse early in the morning where we we’re introduced to the legend himself, Ken Nedimyer (Founder of CRF), Kevin (manager), Stephanie, and Ben (a long-time volunteer and now the most recent member of the CRF staff). The day begun early in the morning with loading tanks and gear on to the Dusky and once the boat was all geared up we piled in to Ken’s pick up and headed for the water! After a short ride out, Ken ties up to a small black mooring ball seemingly in the middle of nowhere. However, it was a whole other story when you entered the water. 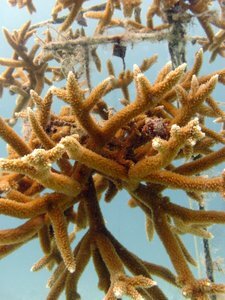 Sitting on the sandy bottom at about 30ft were rows and rows of coral “trees” blossoming with Staghorn coral. Yes, I said blossoming- I’m an admitted coral geek so this is allowed. 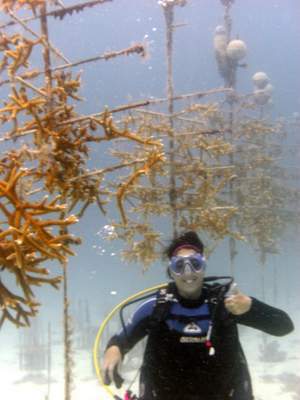 First thing in the water was a tour of the nursery which is home to about 25,000 coral fragments. 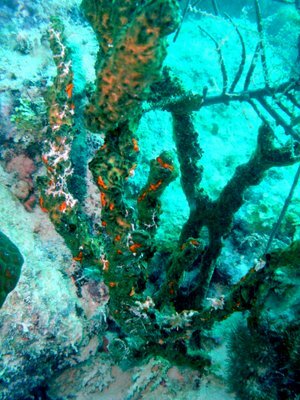 Once the tour was over, it was back to business… Steph or Ken would select a tree and cut corals that were growing on wires attached to PVC pipes. 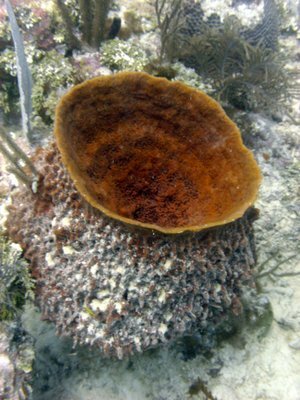 The corals would rain down on Jana and myself as we scurried around the bottom collecting them. 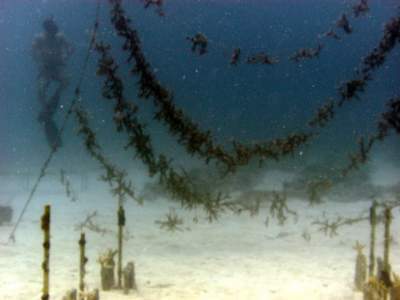 The first task is to clear off the algae growing on the wires and attach a numbered tag representing their genotype to each coral. 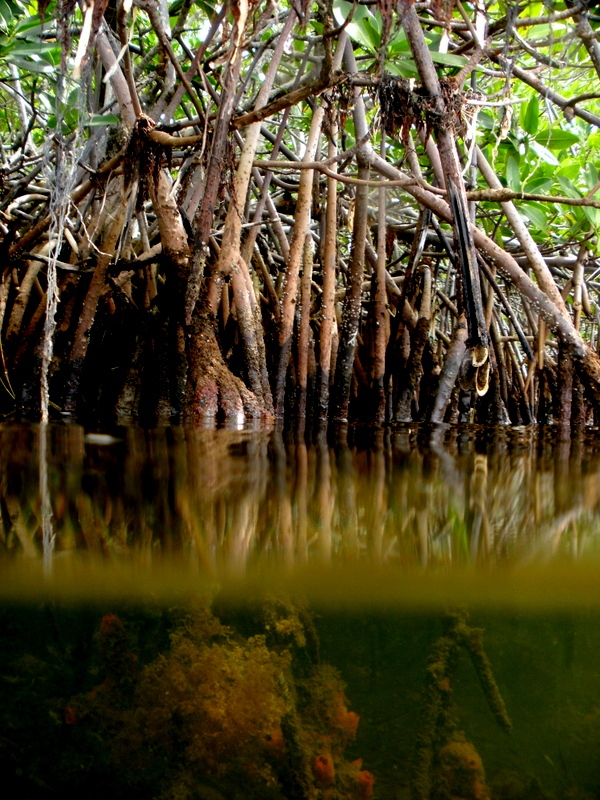 So, one might think that in a sandy bottom with nothing but some PVC Pipe trees and wires with Coral there might not be a lot of wildlife, however, this couldn’t be further from the truth. While pulling off the algae swarms of fish appeared and loved the free snack we were providing them! 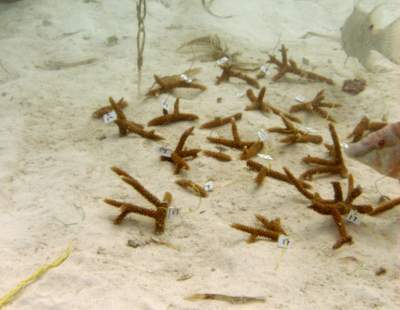 We collected 10 coral fragments from 10 trees (IE 10 genotypes) for a total of 100 individual corals. 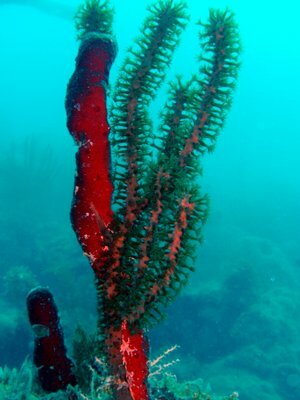 All of the tree’s segments were mixed so that one bundle would have ten coral segments, one from each genotype. These were then bundled together in preparation for their transplantation into the wild! 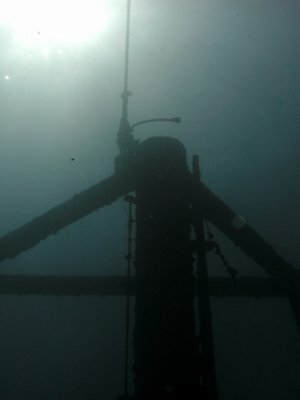 Once we had completed our work we surfaced, not-so-gracefully got back into the Dusky (corals in hand), and headed out towards the Wellwood Restoration site on Molasses Reef, where we dropped in and got to work! Stephanie once again took us under her wing and showed us the proper techniques for literally planting corals!!! Not too hard right? Well let’s not forget to maintain perfect buoyancy hovering only inches from the reef/live coral and the fact that you’re working with actual tools under the water. Oh, and remember to avoid the labyrinth of Fire coral! We repeated these steps for a total of 10 ovals, planting 100 corals over all!! It’s all in a day’s work. Who says Maine Biologist don’t work 9-5 jobs? We do, we just spend 4 of those hours under the water!!! 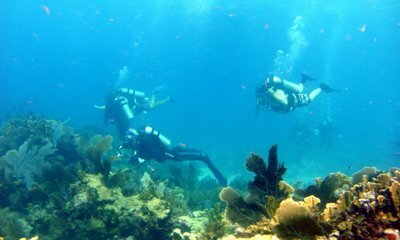 Since our first dives, we’ve been fortunate to go out on quite a few trips with CRF. One of the more noted ones was rather a last minute adventure- It was a quiet morning at the office when out of nowhere we get a call from Ben to be team leaders (We felt so special!). They had a rather large group show up which REEF had actually worked with earlier on some fish survey dives but CRF needed an extra couple of hands on deck to basically act as crowd control. But anytime out with CRF is a good time! The work alone has been an unbelievable experience with highlights such as seeing a Goliath grouper swim through the coral trees and having a personal best dive time of 95mins on a single tank!! 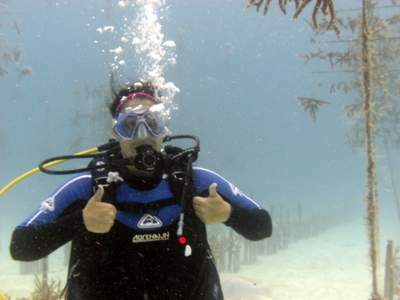 I also now officially hold a PADI Specialty certification in coral restoration! It is truly amazing work the CRF team is doing and I am so thankful to have the opportunity to witness it firsthand. 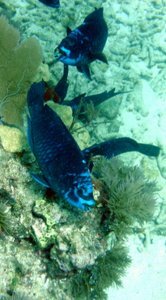 This entry was posted in 2012 REEF Marine Conservation on July 28, 2012 by Martha. This past weekend marked the 2nd installment of the Summer Lionfish Derby Series which took place in Ft. Lauderdale, FL. The event spread the whole of Friday evening and all day Saturday and was a huge success but we’ll get back to that… Friday June 29th myself and the other interns making up the “J-Squad” (Jana, Jessi, and Joel) and Lad (Director of Special Projects) loaded up our rented Explorer and headed to Ft. Lauderdale. Our first stop was actually not Derby related; in fact it was Paul Humann house for the annual REEF Board Meeting. For those who don’t know, Paul Humann along with Ned DeLoach are the founding members of REEF and behind the numerous reef fish ID and critter books published over the years. So for a reef enthusiast such as myself, I might as well have been having lunch at George Clooney’s house! All the REEF Board members were incredibly nice and welcoming and it was such a wonderful experience to meet them and explore the beautiful exotic jungle of a back yard Paul calls home. 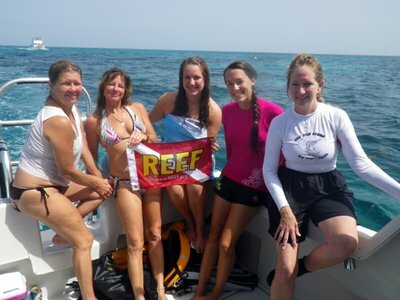 The REEF Board, Lad, Martha & The J-Squad (Joel, Jess (ME), Jessi, & Jana)! 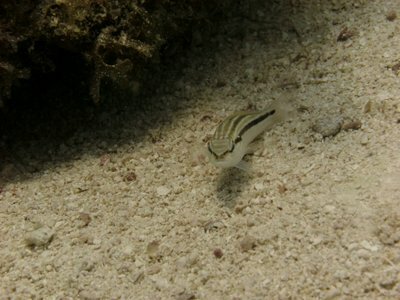 Now, back on topic, the invasive Lionfish (Pterois volitans and P. miles) we’re introduced in the 1980’s via the aquarium trade and have since become the first invasive species to successfully established in Tropical Western Atlantic (TWA) waters. Their native range is the Indo-West Pacific (IWP) where populations are controlled by predation and parasitism. 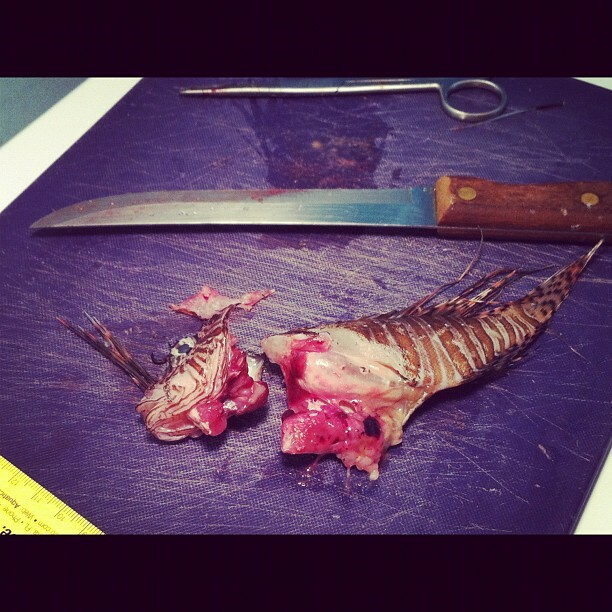 However, in the TWA Lionfish have no natural predators and are significantly less susceptible to parasites. On densely populated sites Lionfish can reach densities of over 200 adults/acre and cause serious damage to native reef habitats by non-selectively removing recreational, ecological, and commercially important species or reef fish and invertebrates. While there is no natural form of population control in the TWA, humans represent a predator of sorts and are at present the only form of control we have. 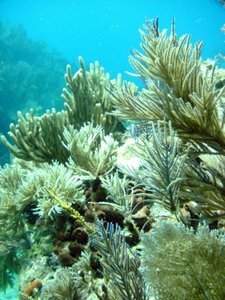 In areas where removal efforts are sustained Lionfish densities can be significantly reduced and maintained to minimize their impact. Progress of Lionfish invasion of Atlantic waters (2012 map as of March). 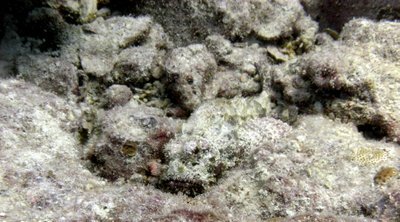 For more information/background on the invasive Lionfish explore REEF’s Lionfish Project and Quick facts on the problem can be found on this one-page fact sheet from REEF, USGS, NOAA and the Simon Fraser University. Unfortunately, the invasive Lionfish in the TWA is beyond eradication and solutions have moved into control and management of the problem. 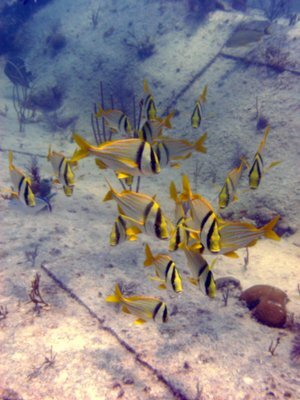 REEF is one of the organizations at the forefront of this movement and among many of their Lionfish Programs is their Derby Series. 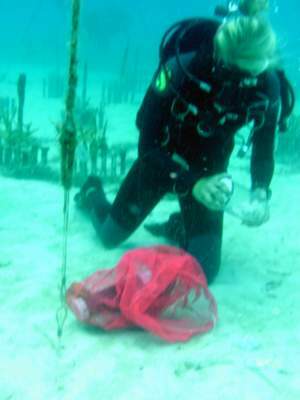 The first Lionfish Derby took place in 2009 in the Bahamas where in a single day they removed 1,408 Lionfish! 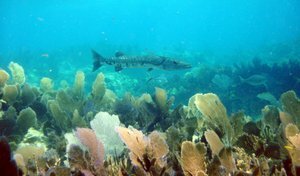 These Derbies are designed to promote mass removal efforts and to date have removed 1,408 Lionfish in 2009, 2,587 in 2010, and 3,542 in 2011. Photos Left to Right: Contender for the Smallest LF, Lionfish Filled Cooler, One of my MANY Lionfish Filets in Progress. The first team in was Brownies Team arriving around 3pm to the 15th St. Fisheries dock. When teams arrive, their first stop is the check-in table where their time-in is recorded, they turn in their site map, and then head over to the scoring table were the counting begins! Now it is just not simple enough to have one table with one scorer, no, that would just be too easy. At each table there is a scorer, a recorder, fish cleaner, and several NSU students collecting samples. Take all that times it by 2 tables, handling 12 teams, and processing a total of 419 fish and things get a little messy (pun intended)!! I manned one of the scoring stations and in what little down time there was I jumped in to help with the cleaning process. In fact, this was my first time ever filleting a fish. One filet quickly turned into 40+ and it dawned on me that choosing a Lionfish as my first fish to filet was probably not the brightest idea but I’m happy to report no puncher wounds were sustained! Overall I was so surprised by how many different uses there were for the Lionfish—we had the Chef of 15th St. Fisheries cooking Ceviche, students collecting tissue samples, stomach content, and carcasses for parasite studies, and we even had one of the team’s members after the tails of the Lionfish for her Jewelry. So in the end there was very little evidence left of the invasive critters except for all the smiling faces of the crowd. 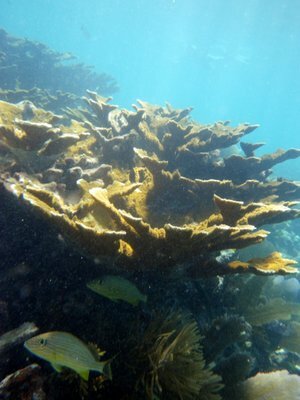 This entry was posted in 2012 REEF Marine Conservation on July 10, 2012 by Martha. One fish, Two fish, Red fish… What’s THAT fish??? 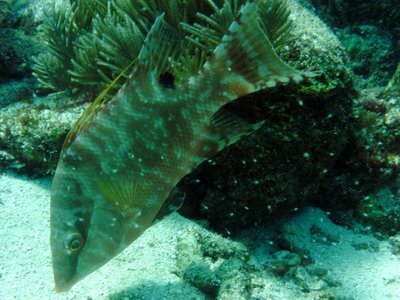 REEF’s volunteer fish survey project begun in 1990 and has since accumulated over 160,500 surveys. The project (and REEF itself in a way) is built on the idea of the “citizen scientist”—everyday people who have a passion for the ocean can contribute to scientific research and marine management without having any formal training. In other words, the survey method was designed so anyone, not just a seasoned researcher, can get in the water and do a fish count. All they have to do is be able to identify one fish! Because survey dives are designed for anyone we practice the Roving Diver Technique which is basically get in the water and swim around—no line transect or quadrat to worry about—it’s very user friendly! My favorite aspect of the survey project is that it uses common names, not scientific, which for a student whose foreign language skills are completely absent it is nice not to have to learn Latin. Each survey records both the name and density of species IDed using abundance codes such as: S-Single (1), F-Few (2-10), M-Many (11-100), and A-Abundant (101+). Once the dive is completed the data is entered in an online database which is freely available to explore and has been used by students, researchers, and managers for scientific publications. I think what I enjoy most about these survey dives it that it makes your time in the water a little more interactive by basically being an underwater scavenger hunt and what could be cooler than that!?! Now, one of the personal advantages to becoming an avid surveyor is working up the ladder to different fish ID experience levels. If you can ID one fish you’re at level 1 and can work your way up to the expert levels of 4 and 5 (over 35 surveys and passing the advance fish ID quiz). If one is lucky/dedicated enough to reach the advance levels they are invited to join the Advanced Assessment Team (AAT). 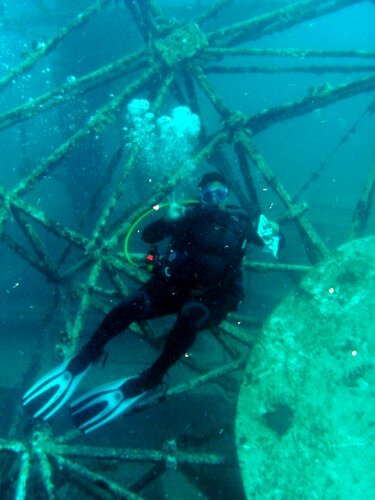 Members of the AAT are eligible to participate in special regional monitoring projects such as the Vandenberg artificial reef in the Keys and Monterey Bay National Marine Sanctuary off California. Not that I expect to reach this level of awesome by the time my tenure at REEF has ended but maybe eventually if only because the AAT gets all the cool T-shirts! 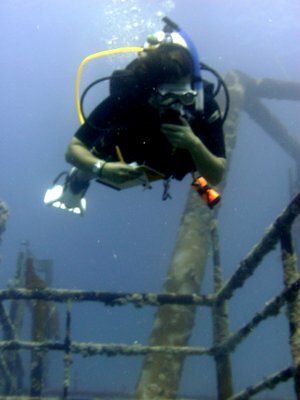 This entry was posted in 2012 REEF Marine Conservation on June 19, 2012 by Martha. This being the first of many postings to come I thought I should introduce myself to kick things off… I grew up in Chapel Hill, North Carolina and because of many family trips to the coast I’ve always had a love of the ocean. In 2009 I graduated from the University of NC at Wilmington with a BS in Marine Biology. During my time as an undergraduate I spent a semester studying abroad at James Cook University in Townsville, Australia. This semester abroad was a turning point in my life when I got the opportunity to explore the Great Barrier Reef. Since then I’ve been hooked on corals! 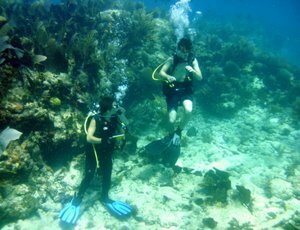 With this new love for coral reefs, I quickly found myself investing in the conservation and management side of reef science and have since been following my interest wherever it takes me including places like Curaçao, California and even Australia for a second time to pursue a Masters degree. What’s next? You guessed it, KEY LARGO!!! 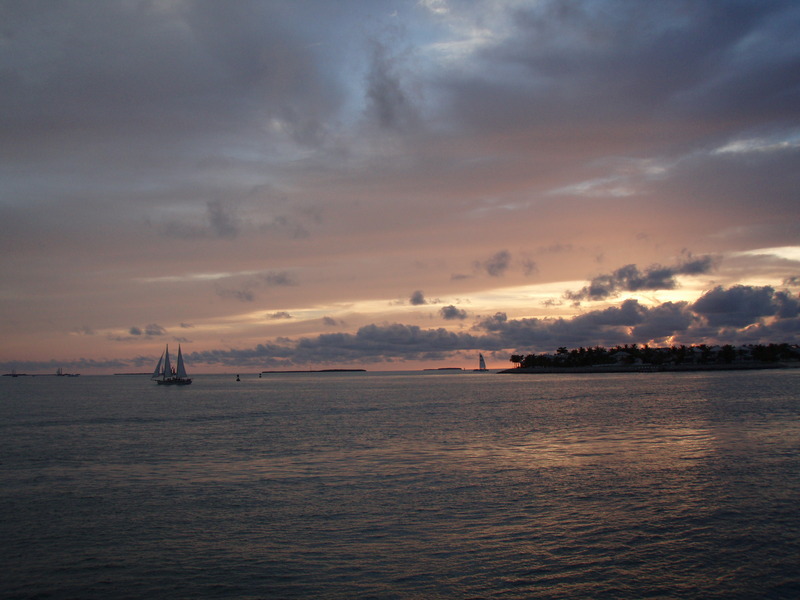 First impression of Key Largo is that it is a large city with a small town feel. Everyone has been incredibly nice and welcoming while I settle in to the internship. 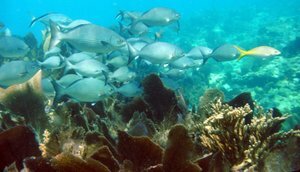 The Reef Environmental Education Foundation (REEF) has many projects available to us interns (ones already in the works and opportunities to set up new ones) and although only having just begun the Internship they have kept us busy busy busy! For instance, orientation DAY 1- the other interns and I find ourselves at a dock waiting for one of the local head boats to return. At the dock also happened to be a NOAA researcher waiting for the same charter to come in. After a quick round of introductions we create an assembly line of sorts on the boat. The man with NOAA takes the weight and length of these giant Black Groupers then removes the otoliths and gonads. Once he is done he passes this huge SLIMY (seriously, I was covered in Grouper slime from elbow to thigh! But I’m not complaining about it), fish over to us and we remove the stomach. By day’s end we had handled a total of 120lbs of Black Grouper and removed five stomachs. In the days to follow we learned all about REEF, both the in-office workings and the various projects we would be involved in such as their ongoing Fish Survey Project and the ins and outs of Lionfish (literally). And to cap the week off myself, Jana (fellow intern), and Lad (Special Projects Director) went out for the first dive and fish survey. Which went extremely well. Highlights included spotting an Eyed Flounder, Spotted Morey, and even a couple of common Snook (my first time ever seeing that one). 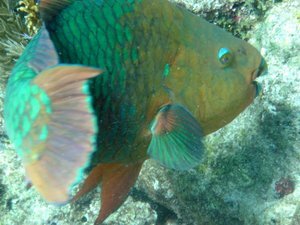 Mid-dive, I found myself surrounded by a school of the beautiful Midnight Parrotfish… not too shabby of a way to end the week. So that’s that for now. 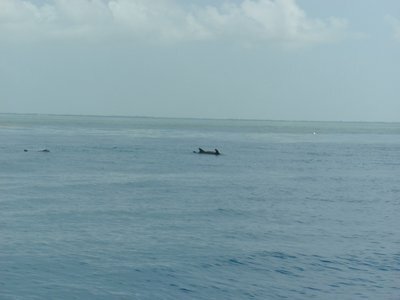 Enjoy the pics and there is plenty more to come from the Keys… Stay tuned! 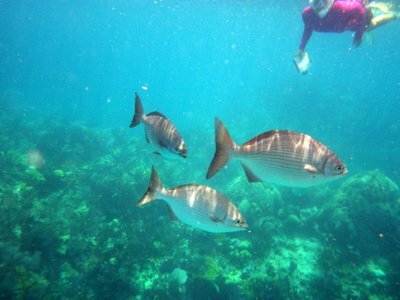 This entry was posted in 2012 REEF Marine Conservation on June 6, 2012 by Martha.